I drive quite a bit for my job, and I see something worth sharing almost every day. I decided that I'm going to try and take pictures of some of this stuff to share with everyone. SO, can someone explain this? And just to satisfy curiosity, I had to get a look at the driver to see who would do something like this. Oh, and this wasn't tied down, he was driving at like 20 MPH. Then there's this guy. This one isn't as funny, but I'm wondering, "why?" 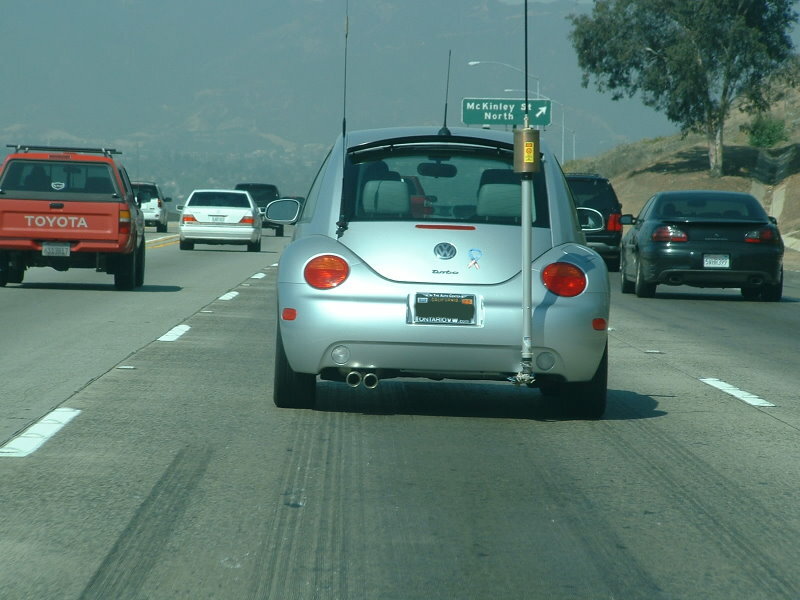 The tip of his antenna had to be over 10 ft in the air. It was more like a buggy whip. Obviously he's a radio junky of some sort. Now THIS could turn into a very interesting thread!! Now this is just wrong on so many levels! The first shot is obviously a Mustang, and we all know horses love hay. Maybe that's the next thing in alternative fuel sources. second: God must have some free time latley, and has taken up Radio Controlled cars... could explain the bizzare weather . Yes, that guy is a big radio junkie. I know you blanked out the license plate, but I can still tell it is an old black and yellow one. A true ham radio guy gets his call numbers on his personalized plate. This guy has been into it since the late 60's early 70's. I've seen a few like this. You guys should see some of the crazy small-town trailer trash around here running around in their big old gas guzzling welfare boats with double whip antennas and CB radios we have running around here. Some of them are still listening to 8-tracks or cassette decks and won't own a cell phone or a computer, and have a rusty old TV antenna next to their trailer because they live too far out in the sticks or they refuse to pay for cable TV. They crack me up everytime I see 'em. 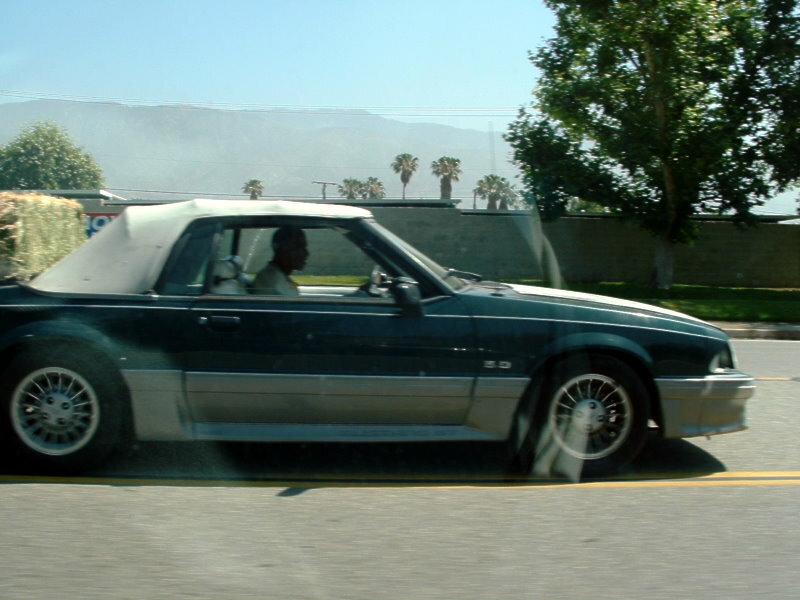 LOL, ya, maybe he thought his Mustang was flexfuel powered. Radio controlled. Good one. That's what it looked like too. 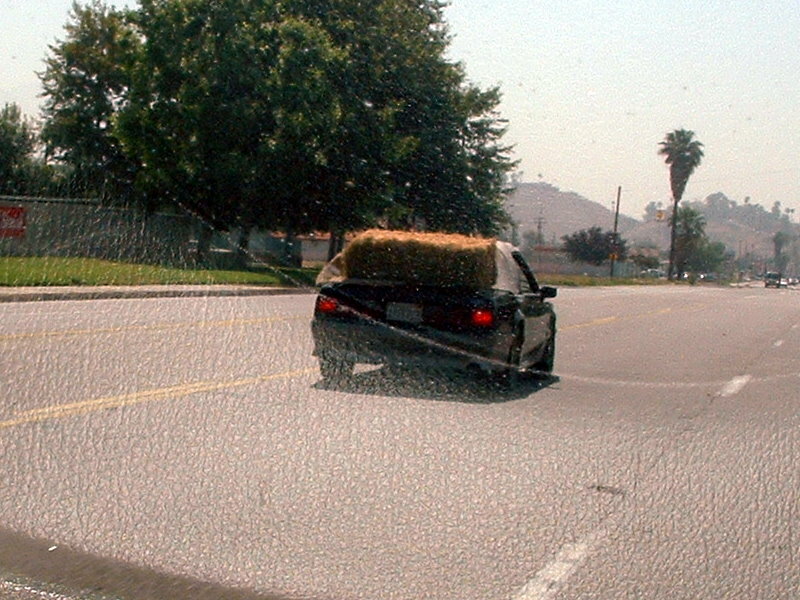 now now, i carried 2 bales of straw for my dogs house once with a Chevy cavalier. one in the trunk and one bungeed to the granny rack. Saw this north bound on I-5. I hope he got off at Lake Castaic, other wise he was going to climb over the Grape Vine with this thing. It was running down the road really well actually. Izzat like an ant carrying a sandwich? He did pass me once, but you see who's in the passing position in the pic. And I was grossing about 100,000lbs. Come on Ben. We need more of these. I watched a car roll through a red light making a right turn today in front of me. Only this time, finally, a cop saw him too! And he took action! Out here you see lowbed dirt equipment movers with Tonka dozers tied down on the trailer when they run empty. What are you driving? I don't recognize that hood. The one in the middle, to be exact. International 9900 with a big red ISX cummins motor. They've got it turned down to 85mph. And with liquid in the back 85 is too slow?? The KW I drive tops out at about 74. But I stay in CA. all the time where the speed limit for trucks is 55. 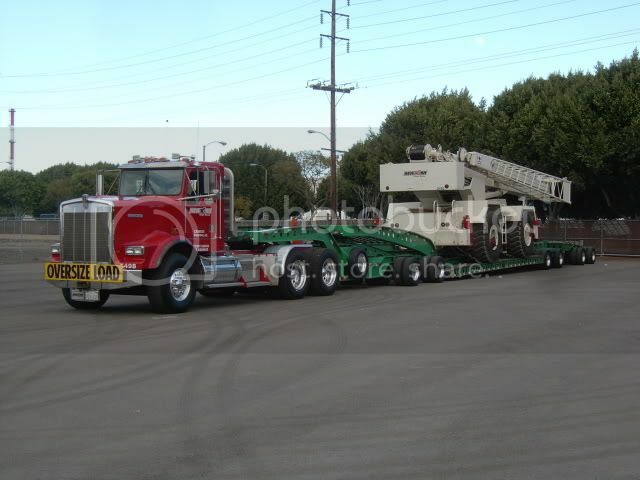 The low gears are very helpful with the oversize loads I haul. 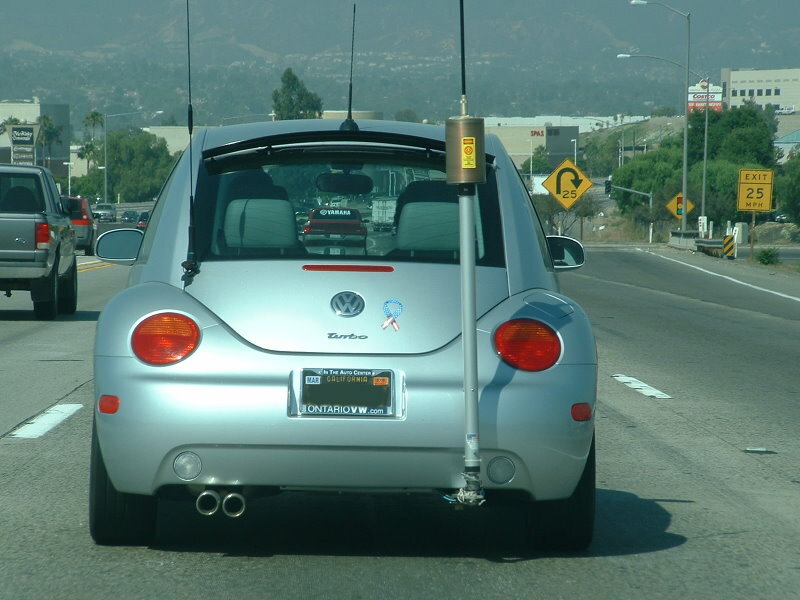 I always thought those looked pretty cool going down the road. I wouldn't want one, but I would like to see how it was set up inside.